which belong to Scelsi's later phase, and attest to a supreme contribution in redefining classical music. The music is masterfully performed by the Radio-Television Orchestra and Choir of Krakow, directed by Jürg Wyttenbach. 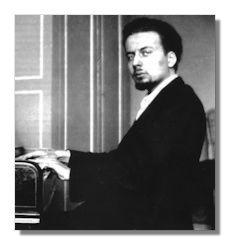 Most of these works had to wait until the late-80s for a first performance, though Scelsi was still able to attend before passing away on August 9, 1988. The placement of these works within Scelsi's large output can be divided into four periods – such a distinction is, of course, in some ways arbitrary; however, the nature of the music lends itself well to this division and in particular it is important to know the break between the first and second groups. In fact, Scelsi's music in his Second Period represents a dramatic departure from the trends of his time and is almost completely unconnected with the more traditional music of his First Period; some ideas do continue intact, such as his sense of form, but on the whole his output could easily (assuming the daunting technical skill involved, of course!) have been written by two different composers. Scelsi was to state with some pride that by the early-50s he had forgotten everything he ever knew about music. The three discs were recorded in 1988, 1989 and 1990 – shortly following Scelsi's death – and then packaged as a set. The first disc [Aion (1961), Pfhat (1974), Konx-Om-Pax (1969)] is the most powerful and characteristic of the set. Here we find Scelsi's most abstract and symphonic work, followed by his most singular and specific, followed by his most majestic and effective. Starting with the awesome rhythmic power of the first movement of Aion, the disc ends in the peaceful triumph of the final om-ing of Konx-Om-Pax, an incredible journey in sound. The second disc [Quattro Pezzi (1959), Anahit (1965), Uaxuctum (1966)] is the most varied and experimental of the set. It begins with Scelsi's most revolutionary exploration of the power of a single sound – the piece which unlocks his great series of masterpieces during the 1960s, followed by his most beautifully lyrical orchestral work, and climaxing in the incredible mystic drama of his most complex and difficult creation. Finally, the third disc [Hurqualia (1960), Hymnos (1963), Chukrum (1963)] fills out the set. It begins with the epic return to full orchestra in Hurqualia, followed by the healing return to harmony in Hymnos, and ends the entire set with the symphonic 'quartet' Chukrum presenting all aspects of his mature style. Scelsi's music for orchestra is his supreme contribution to the most characteristic genre of western classical music – these are pieces which will be heralded far into the future of music. The following list includes all CDs of music by Giacinto Scelsi of which I am aware and which are exclusively of music by Scelsi. Copyright © 1992-2000, Todd Michel McComb.